In A THIEF REVEALED, romantic thriller author Heather Sunseri brings you the first book in a new romantic suspense series. The INTERNATIONAL THIEF Series offers a look into high-society Europe and how one woman is forced to steal priceless art and valuable jewels. The series is action-packed, heart pounding adventure, and both the romance and the suspense will keep you up late at night. Wow! Another intriguing story by Heather! This is the story of Dimitri Tobias and Lola Parks. Lola is a thief of jewelry and art but not by choice. Dimitri is hired by the Somerset family to protect the family and priceless jewelry and art collection. What Dimitri didn't anticipate is falling for the thief. Lola didn't anticipate being caught but yet she was by the handsome Dimitri. From here the two go on an adventure that involves theft and murder, which Lola is guilty of one but not the other. Dimitri tries to clear Lola's name and keep her safe from the bad guys. If you want to find out how this story ends, please read the book. Unfortunately, we have to wait to see what happens with Dimitri and Lola as the story continues in the next book to come out and I CAN'T wait for it to come out. Dimitri has always been a semi closed off character in the Darkness Series and I am excited for him to get his own series. In this story we are given a glimpse behind the veil that is all Dimitri, the services he offers and the people who hire him (other than Declan and Brooke). It appears that in this story, Dimitri has finally met a woman who captures his attention. The only problem, she is a thief that has gotten tangled up in some messy business and Dimitri is there to save the day. Lola unfortunately stumbled into the world of thievery but she is very good at what she does even if she has to contend with unsavory characters. Together the two of them race to find the person responsible for the circus they now find themselves in. I cannot wait until the next installment. 5.0 out of 5 starsAn interesting man, a beautiful woman and stolen art- great combination for story! The first book in a spin-off of the authors’s In Darkness series is an enjoyable story. While the book provides some insight into Dimitri, it is more about the lady that he wants in his life, Lola, who is an art thief. The story is definitely written as a lead in to more stories about the characters. I have loved Heather Sunseri’s writing since the first book of hers that I read in The Mindspeak Series and this book is no different. I am drawn into the character’s lives and want to know more. I am sure that there is a lot more to know about Dimitri’s past, and I am already anxiously waiting for the next book in the series to come out. You don’t need to read any of her other books to enjoy this one and it is very different from her other stories. I recommend the book, hard to put it down! 5.0 out of 5 starsDimitri! 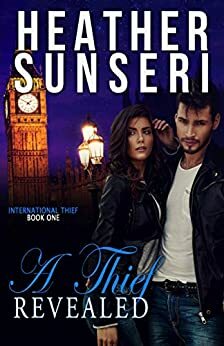 An earlier book series introduced Dimitri Tobias, who I'm thrilled got his own series in "A Thief Revealed" by Heather Sunseri. Dimitri is an intriguing and mesmerizing character with no really personal details. It's almost as if he continually wears a disguise, of which he is a master. In "A Thief Revealed" Dimitri meets Lola Parks, a master of disguise herself AND a master thief. She is worthy to meet the unmasked Dimitri and get into some suspenseful and riveting danger . I call this book a "BIAS".......binge in a sitting. It's difficult to put it down! A Thief Revealed is non-stop action right from the start. I really didn’t see who was responsible coming at all. That was quite the plot twist. Having read the author’s In Darkness series, it was fun to get to explore the character of Dimitri Tobias a bit more. Lola is a very likable character who you just can’t help rooting for. The end is satisfying, but sets up the next book in the series (which I promptly pre-ordered). I highly recommend reading this book to anyone who enjoys romantic thrillers!